More and more attention is being paid to the act of "texting while walking" lately as reports of injuries, embarrassments and even deaths related to mobile distraction rise. 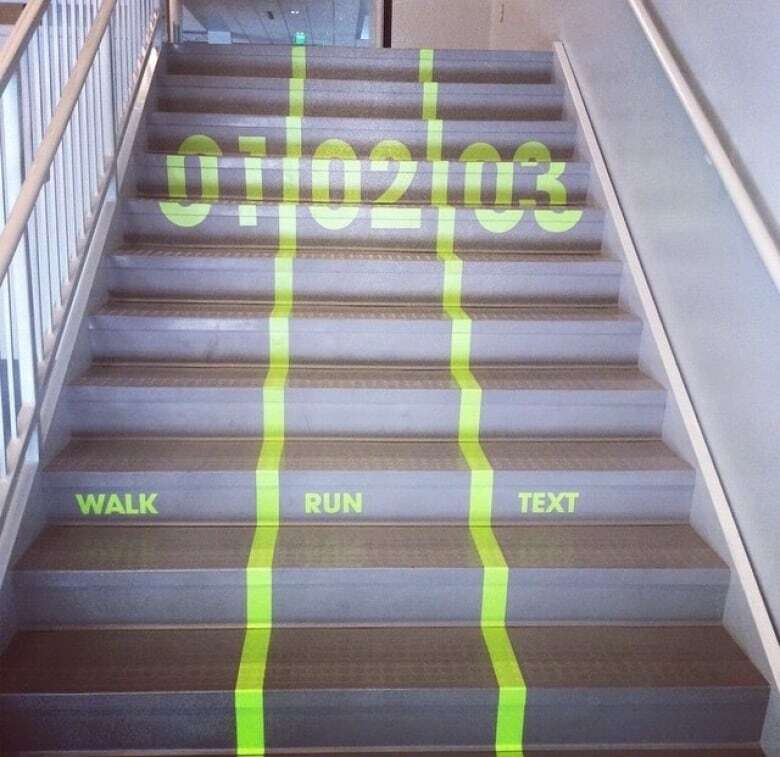 A university in Utah is giving its students who walk and use their cellphones at the same time their own "lane" on stairways in a new student centre. As reports of injuries, embarrassment and deaths related to pedestrian smartphone use rise, so too does the amount of attention being paid to "distracted walking." Lawmakers and public safety organizations across the globe have been working for years to raise awareness about how dangerous it can be to use a mobile device while traveling on foot. Some U.S. cities have even started ticketing "careless pedestrians" for looking at their phones while crossing the street. And yet, despite all of the rules, risks and snide comments from strangers that come with this behaviour, it still persists — particularly among younger people. Utah Valley University appears to understand this well, which is why it's not discouraging smartphone use among its 30,000 students. Instead, the school is attempting to eliminate hallway gridlock by giving texters a lane of their own. 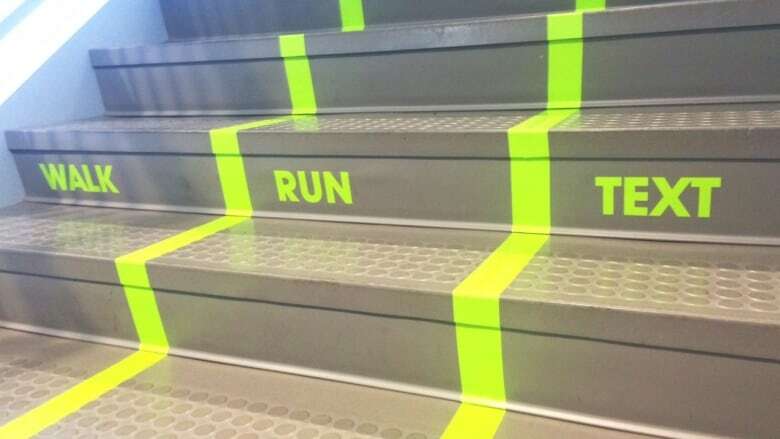 Time reports that a large staircase with designated lanes for walking, running and texting was officially unveiled at the university's new student centre in Orem, Utah, on June 7. While no official school policy has been rolled out to enforce the usage of these stairs, UVU's creative director Matt Bambrough hopes it gets students laughing, talking, and thinking about the issue. "You have 18-24-year-olds walking down the hall with smartphones, you're almost bound to run into someone somewhere; it's something we're dealing with in this day and age," he said in a press release, explaining that the school's intention was "to engage our students, to catch their attention and to let them know we are aware of who they are and where they're coming from." UVU appears to be the first academic institution to create a dedicated walking space for smartphone users, but the creation "texting lanes" in other parts of the world have been making headlines since at least 2012. Last summer, National Geographic installed temporary "phone lanes" for D.C. pedestrians while filming a TV segment about behavioural science, and in September, the Chinese city of Chongqing followed suit with an almost-identical stunt aimed at raising safety awareness. Earlier this week, a Belgian mobile phone repair company painted "text walking lanes" onto several streets around Antwerp. While many outlets originally reported that the city was interested in making the texting lanes permanent, Antwerp Mayor Johan Vermant told Quartz that this would not be happening. "To be frank: we are not at all interested in expanding these lanes," he said via email, noting that the company had violated several laws in an attempt "to get publicity with this stunt." It's certainly fair to say that the issue of distracting walking is an attention grabber. Thousands of tweets about UVU's texting lane staircase have been sent since a photo of it was posted to Reddit last month, many of them praising the project as innovative and calling upon their own schools or cities for something similar. Detractors, on the other hand, point to the staircase as a product of our technologically-obsessed and "self-absorbed" society. Regardless of how anyone feels about it, UVU's texting lane most definitely has people talking — which was Bambrough's main goal. "Most people don't obey the posted lanes," he said in the UVU release. "But [preventing collisions] isn't the reason we did it — we did it to engage the students. It's meant to be there for people to look at and enjoy." Fines for texting while walking?